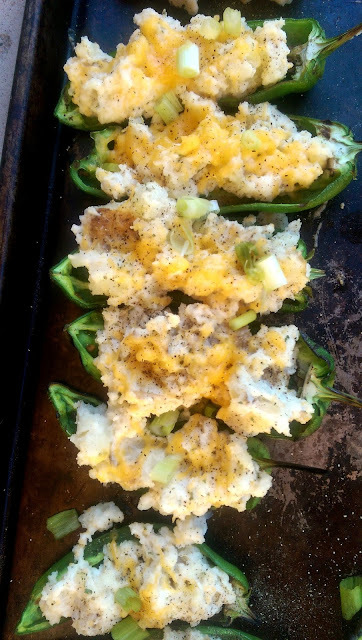 Switch up your typical potato with these Twice Baked Potato Stuffed Peppers. Full of flavor but made healthier with the addition of Greek yogurt. Perfect for any party when you want to impress! One day after work, Troy and I were trying to figure out what to have for dinner. Nothing was sounding good and then I thought about it, I wanted to do something with the peppers in our garden. We had grown some awesome green bell peppers and had been eating some through the summer chopped up in a salad. I knew that there was only about 5 or so left on the plant and I wanted to do something unique with them that was out of the ordinary so we could really enjoy them. That is what my husband Troy came up with the fabulous idea of twice baked potato stuffed peppers. I loved the idea! We spent time in the kitchen cooking together while our little one took an afternoon nap and it was awesome. The peppers turned out wonderfully and tasted great. I would definitely make these again, especially for a party. 5 small peppers, can be poblano, bell peppers, etc. 1. Slice peppers in half and take out seeds. Drizzle peppers with olive oil. 2. Grill peppers for 2-3 minutes each side. 3. Meanwhile. cook baked potato in microwave until soft. 4. Mash together potato, Greek yogurt, milk, spices and 1/2 of the shredded cheese. 6. Bake in oven for about 10 minutes or until cheese is melted. 7. Top with green onions. Enjoy! These serve well for leftovers too so feel free to double the recipe or even make them in large green peppers. If you do this, make sure to use more potato so you have enough filling. Until next year delicious homegrown green peppers!